Fall is my very favorite season – always has been and always will be. The weather is incredible, the colors unbelievable. Fall seems to linger a little longer than Spring, especially in the Midwest. Winter seems to hang on to its icy grip a little longer than it should, then there’s a few short precious weeks of mild temps, ubiquitous blooms that don’t last nearly long enough, then BAM! Spring is done and Summer’s heat and humidity sets in far too soon. It seems to me that Fall begins gradually, with temps slowly slacking off, and days filled with intense blue skies, followed by cool, crisp evenings. Life’s hectic pace seems to slow down just a bit as the leaves change and slowly fall to the ground. 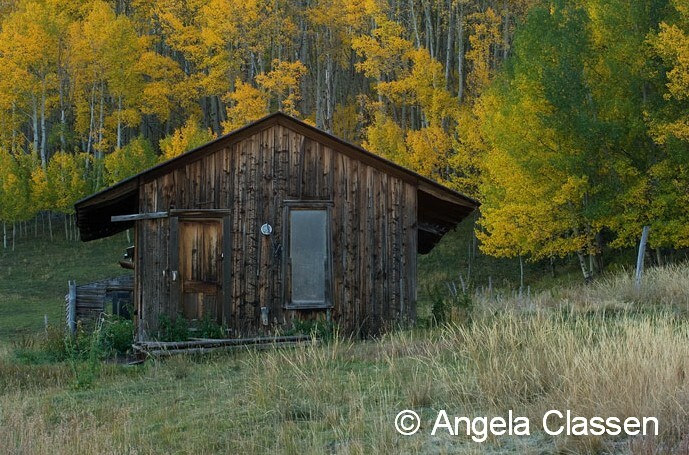 This year I’ve experienced Fall in a whole new way in my new home at Grand Junction, Colorado. 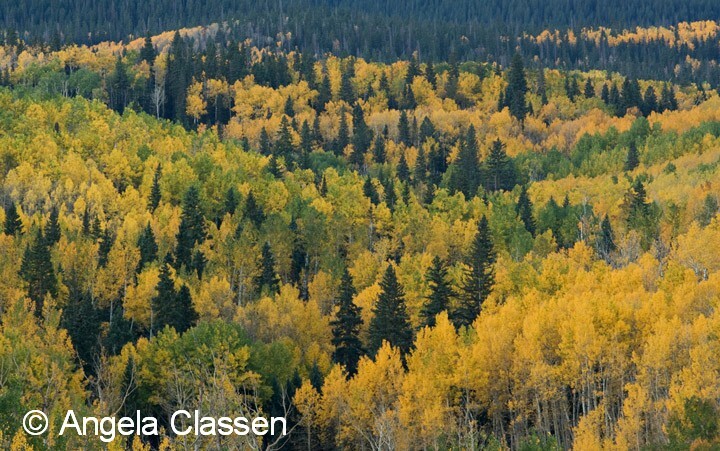 Up until this week, this Fall was unusual – unusually warm. Temps were about 15 degrees above normal, and the leaves were much slower to change, making it possible to savor Fall’s beauty a little longer. That was just fine by me! 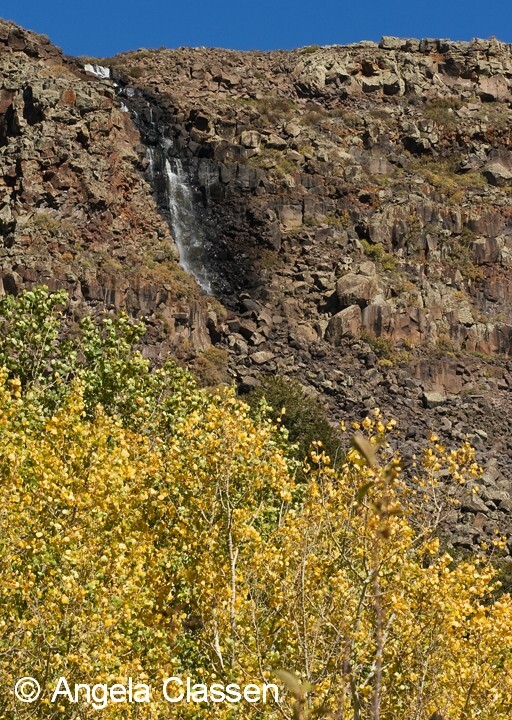 I was fortunate to arrive in beautiful Colorado just shortly before Fall’s show began, and I enjoyed the spectacle. 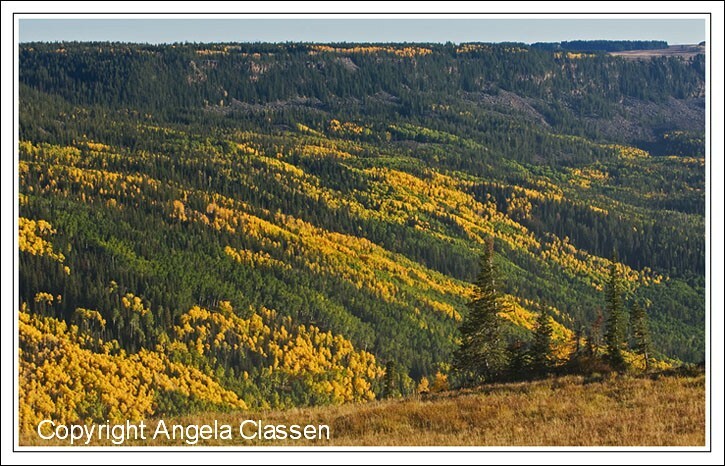 We went up to the Grand Mesa a couple of times to enjoy the color, which was incredible in its own rite. The ride up the Land’s End Road was a sight to see, with mountainsides full of color and a waterfall at the top to boot! The first weekend of October, I attended a photo workshop at Ouray led by Bret Edge and Todd Caudle, two mighty fine, talented (and fun) photographer dudes. They both have top-notch images, and are willing to share their photographic knowledge with others in a friendly, nurturing environment. They won’t take you out, dump you off, and head off to spend the rest of the time shooting their own images, leaving you wondering what the hell you paid for. (Believe it or not, I saw another workshop group at Dallas Divide and it seemed to me the “leader” wasn’t helping his participants at all. Nope, his tripod was planted in the prime photo spot with him parked behind the lens while several of his students were looking rather like deer in the headlights. Sad, but true…) Bret and Todd will not do this, and I highly recommend their workshops. Unfortunately, since I just started a new job, I was unable to attend the Friday session, when everyone headed out to Owl Creek Pass and Silverjack Reservoir. I’m disappointed I didn’t get to see these two very photogenic spots, but that gives me motivation to head down there next year on my own. I was able to attend both the Saturday and Sunday sessions. Saturday began on the Silver Pick Rd. 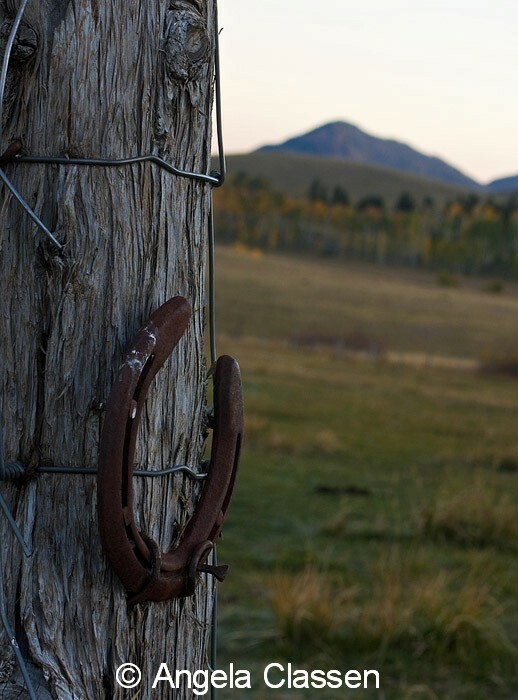 near Telluride. We shot from the Wilson Mesa, back toward Wilson Peak. Todd told us this was the peak that is featured on the Coor’s beer labels. Knowing Todd and his bizarre sense of humor, I’m still not sure if he was telling me the truth or just pulling my leg… At any rate, the peak was nothing short of awesome, especially once the alpenglow hit its face. I really enjoyed playing with different compositions and different focal lengths at this spot. I was really intrigued by the sweeping patterns on the mountainside created by the alternating layers of conifers and aspens, and used my 70-200 mm lens to isolate and create this abstract view. We spent the rest of the morning shooting on the Silver Pick Rd. in various locations, and Todd explained to me how best to capture a sunburst. I’ve never been very successful with sunbursts, but I think he finally pointed me in the right direction. This backlit aspen grove was the perfect spot to try out the technique, since I could block some of the sun with the trees. Use of a very small aperature (and tripod) is the key. Also, don’t use filters. They cause light diffraction and may ruin the effect you’re trying to achieve. Todd also told us to be sure to “look down” because photo opps are often literally under our feet. Since I tend to shoot a lot of macro shots anyway, I usually try to do this. 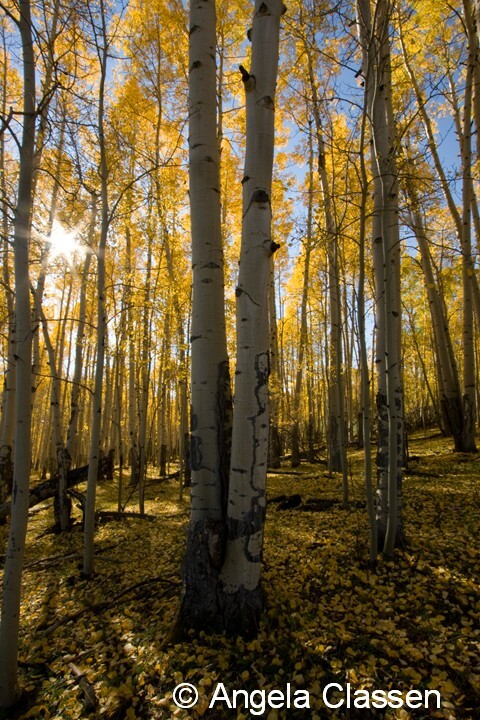 I walked around the aspen grove a little and found this lovely little scene. 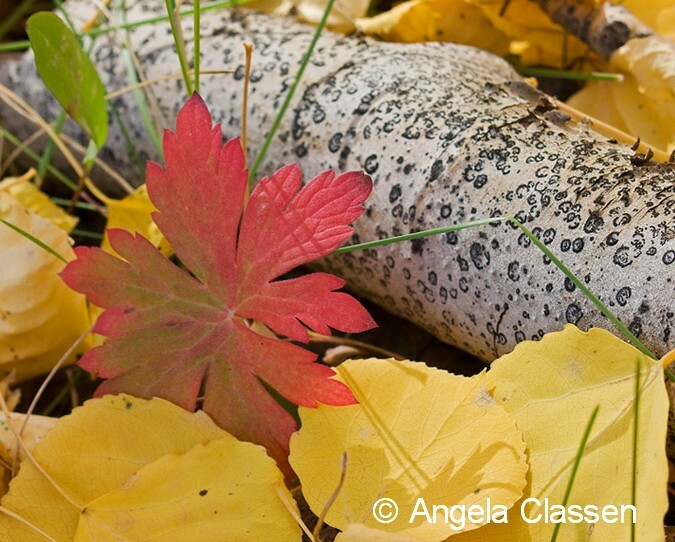 What drew me in was the combination of glowing aspen leaves, the vibrant red leaf and the texture of the fallen branch. I tried to be lazy and get by without my tripod for this shot, but it didn’t work so had to break it out because I wanted this shot. 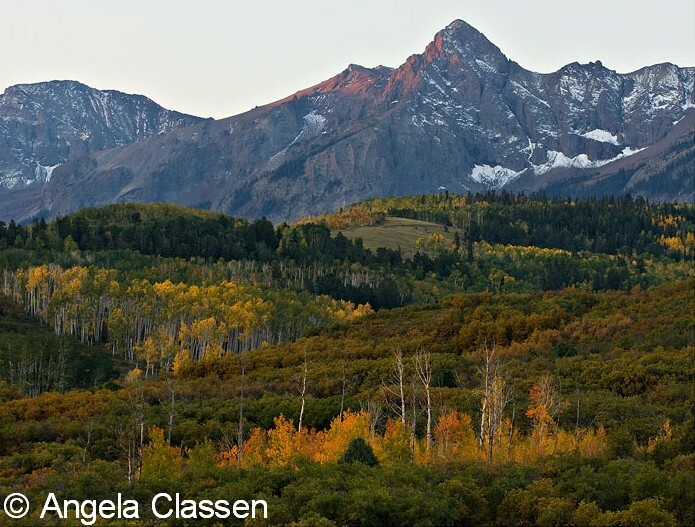 After lunch in scenic Telluride and a critique session of our photos, we were off to chase more beautiful scenery. We went to Mystic Falls, where there were not one – but two! – amazing waterfalls. 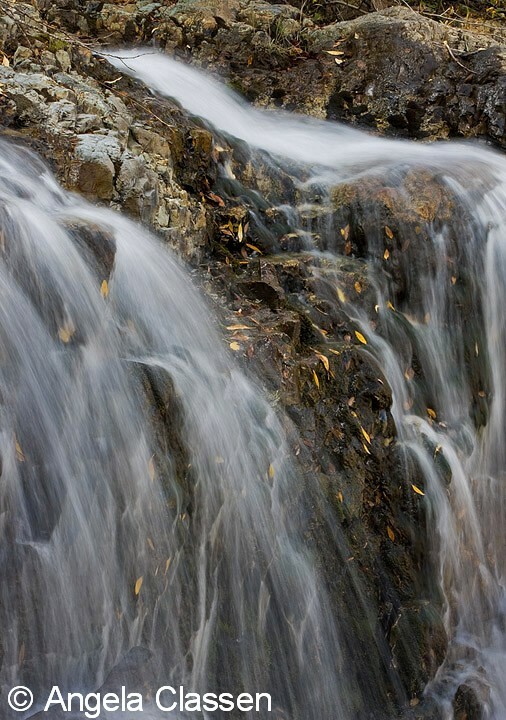 The larger fall is hidden from view by the first, and is reached by taking a very short, easy hike across the stream and onto the ridge off to the side. 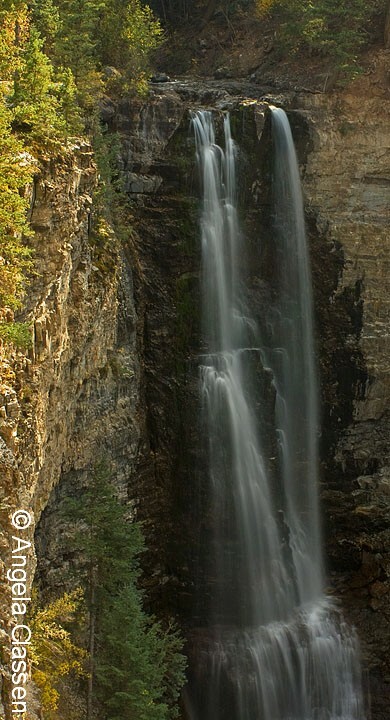 I love to shoot falling water, be it large falls like these or small little gurgling cascades. From this location, I was able to do both! Unfortunately, I’m afraid of heights and to shoot the main fall involved standing on a small, sloped area above a high cliff, so I didn’t tarry long in this spot, beautiful as it was. Exposure was a bit difficult at this spot, and I used my Singh-ray Vari-ND filter to allow me to use longer shutter speeds to smooth out the water. It took several attempts before I got one that wasn’t either over- or under-exposed. And then there was that flare thing… Someday I’ll learn to use my lens hood! 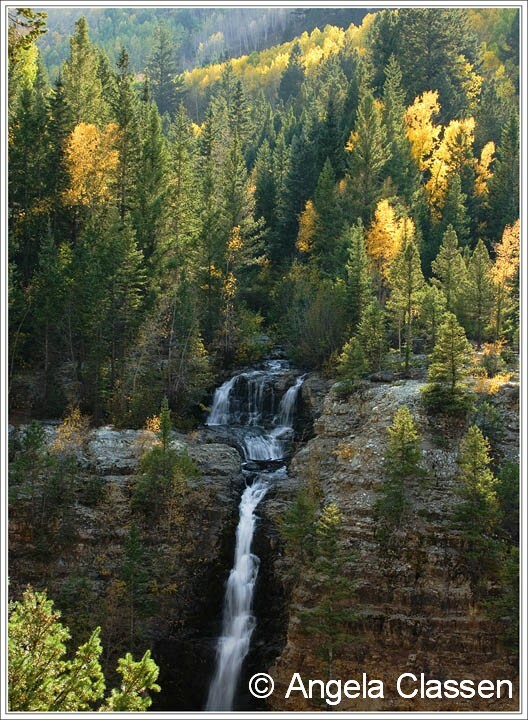 Here I focused on a small cascade, rather than the entire fall. 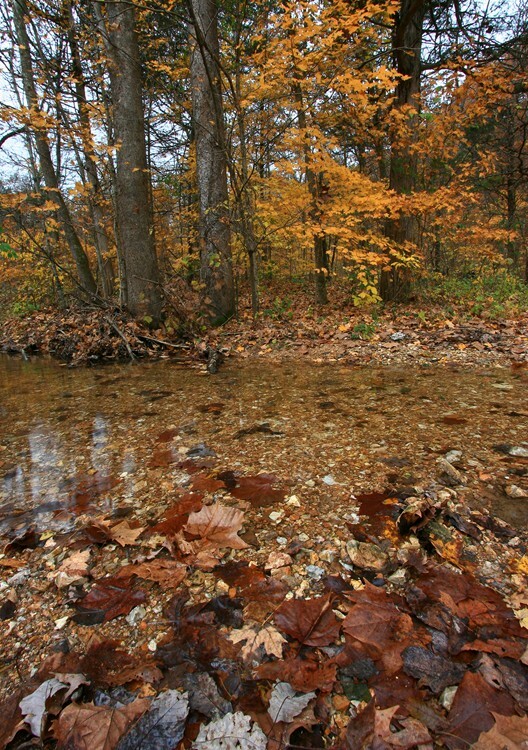 I spotted the bright leaves in the water, and thought they added interest to the icy water. Our last stop of the day was the Alta Lakes area. They told us the area right around the lake didn’t contain great fall color, but we could focus instead on reflection images. The area didn’t disappoint, as the lake turned into a glassy mirror! I did use my Singh-ray 3 stop GND filter here, to help tame the contrast between the dark foreground and the bright sky. This filter is one of the most useful ones I own, and I wonder how I ever tried to create images like this before I learned how to use it. 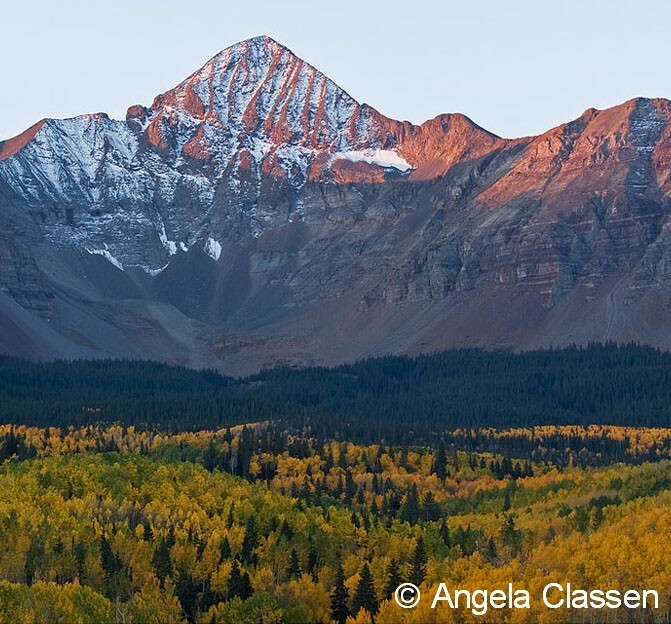 The next morning’s shoot was at the Dallas Divide area. I didn’t enjoy this shoot as much as the previous morning, because it was colder and windier. I cursed myself for not getting tripod leg covers. Nothing is colder than a metal tripod in the winter. Definitely going to get those puppies covered before Winter fully sets in. 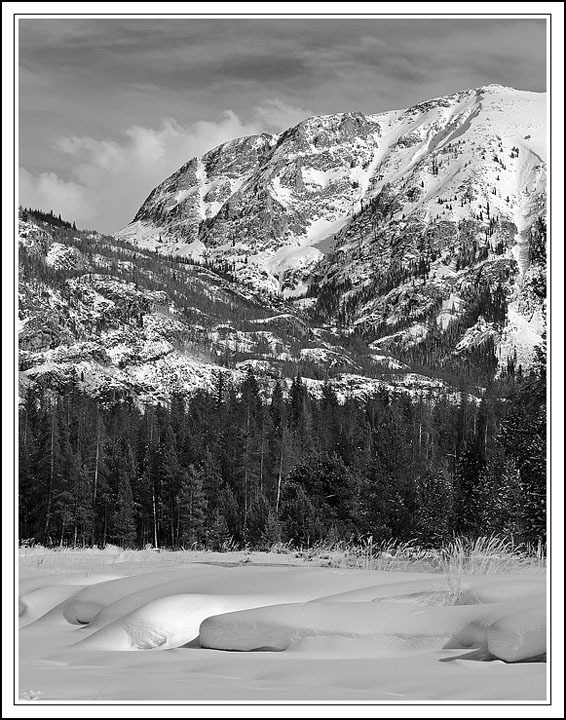 I will probably use my cheapo method described in my previous post, “My Winter Shooting Tips.” The Dallas Divide was indeed beautiful and I see why there are so many images shot at this area. Again, I experimented with different focal lengths and compositions. I found this small stand of aspens that had already shed their fall garments amidst a little “island” of vibrant scrubby bushes and trees and used my “big boy” (70-200 mm) lens to focus in on this little scene. Far too soon, the workshop was over. I thoroughly enjoyed hanging out with some fellow photogs and picking up a few tips along the way. After having lunch in Ouray, my husband and I headed up toward Yankee Boy Basin, which my husband had ridden up the previous day on his mountain bike. Yes, he’s crazy! We didn’t make it quite all the way up there, as the weather was starting to turn so we decided to head back home. Now that I’m only a couple hours away, I’m anxious for next summer’s wildflower bonanza to start in the YB Basin area. I know for sure I’ll be headed there at some point during Summer. 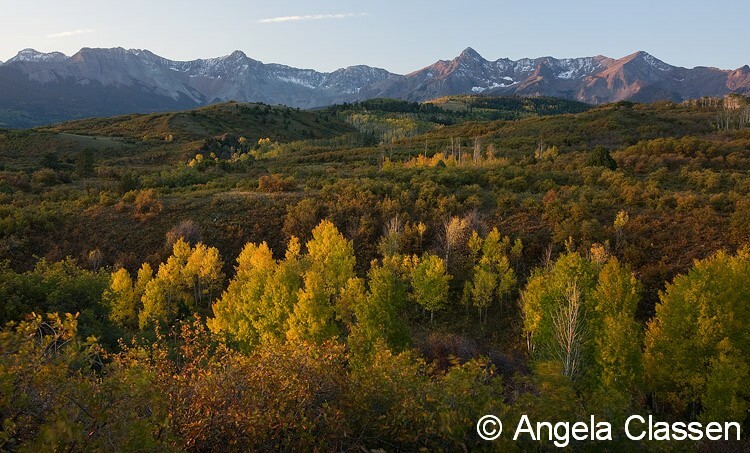 The great thing about living in GJ is that once the aspens in high elevations have shed their bright garb, the cottonwoods and other trees in the Valley start turning. Round Two!! I headed up to the Colorado National Monument this weekend because the sun was playing peek-a-boo with the clouds and I thought there might be some photo possibilities. At the Fallen Rock overlook, to my delight I found some brilliant cottonwoods arranged in a pleasing “S” curve in the wash below. I waited until the trees were spotlighted and the lighting on the canyon walls was right before I shot this. While waiting, I enjoyed the peace and solitude of the Monument as I pretty much had the place all to myself. I’m keeping my fingers crossed that there will still be some color out there this weekend. 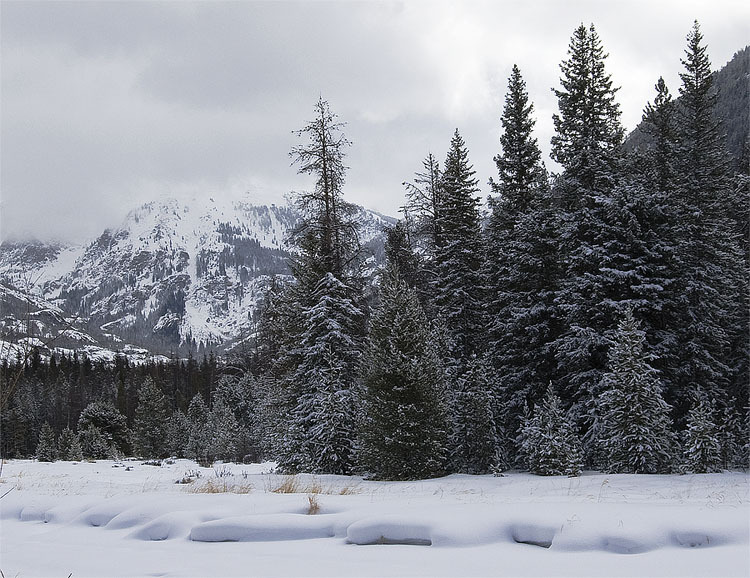 The Mesa received its first snowfall this week, and the wind has been howling after the passage of a cold front. Wish me luck so I can savor the last bits of Fall! P.S. I know I’ve been rather lax lately on blog posts, but the moving process and my new job has kept me away from photography much more than I want. I’m hoping things are starting to settle down somewhat, so check back soon for another post. What’s your favorite season to shoot and why? I’d love to hear your thoughts so please post a comment if you have time. Thanks! My husband and I and friends from Topeka recently spent a great four-day weekend (March 26-29) in the Ouachita Mountains of Arkansas. For those unfamiliar with the area, it is a mountain range that runs east-west straddling the Oklahoma-Arkansas border, south of Ft. Smith. 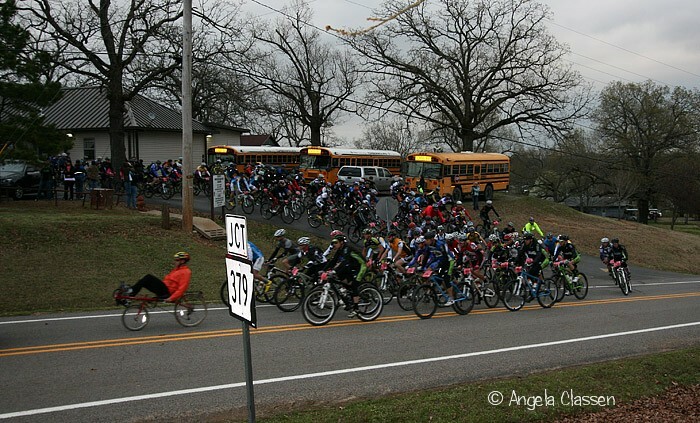 The reason for our trip was my husband’s participation in the Ouachita Challenge mountain bike race. He has raced the last several years and loves the challenge. This year’s course was 67 miles long with around 6,900 feet of elevation gain throughout the course. He finished with a time of around 6 hr. 50 min., and placed in the top 10 for the 50+ age group. On our way down, we stopped at the Devil’s Den State Park and hiked two trails: the Devil’s Den Trail and Yellow Rock Trail. 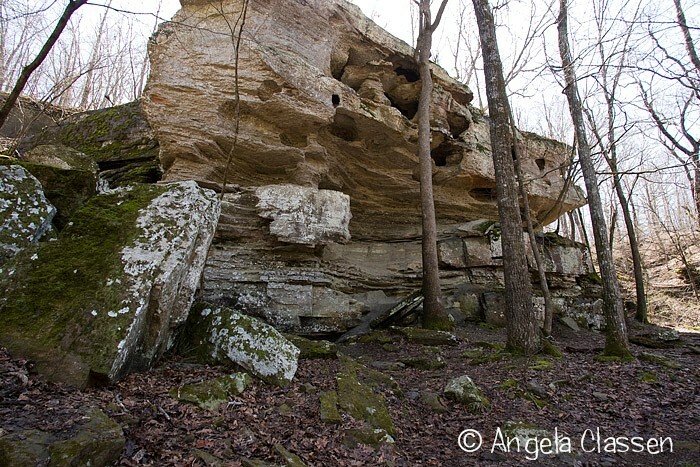 The Devil’s Den Trail contains some amazing rock structures, twin waterfalls and small caves. 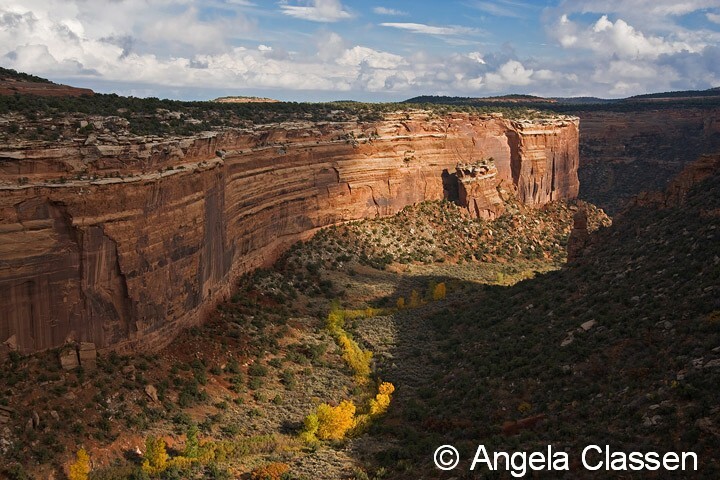 The Yellow Rock Trail climbs steeply at the beginning and allows for some amazing views of the sandstone walls. The Yellow Rock overlook affords fantastic views of the surrounding Boston Mountains and Lee Creek. 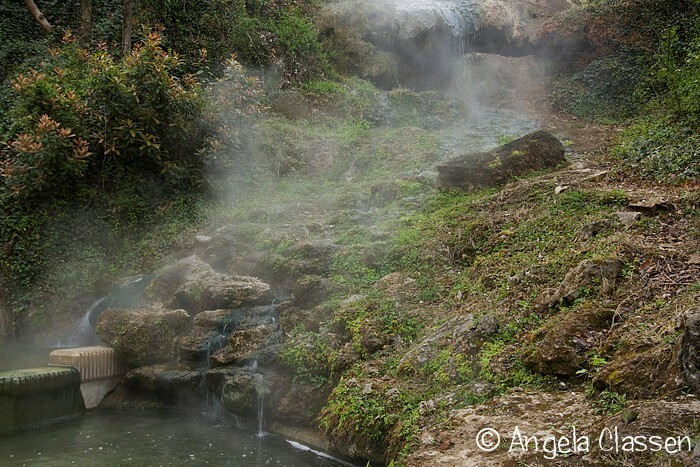 Saturday we traveled to Hot Springs and checked out the National Park, walked by the bath houses and toured the Fordyce Bathhouse, and hiked a couple of trails, one which we followed to the very top of Hot Springs Mountain. What a view of the city! Our next stop was the Garvan Woodlands Garden, a beautiful botanical garden located on the shores of Lake Hamilton. The pear and cherry blossoms, daffodils and tulips were a delight for the senses, especially after the long winter we experienced. The grounds are absolutely beautiful. 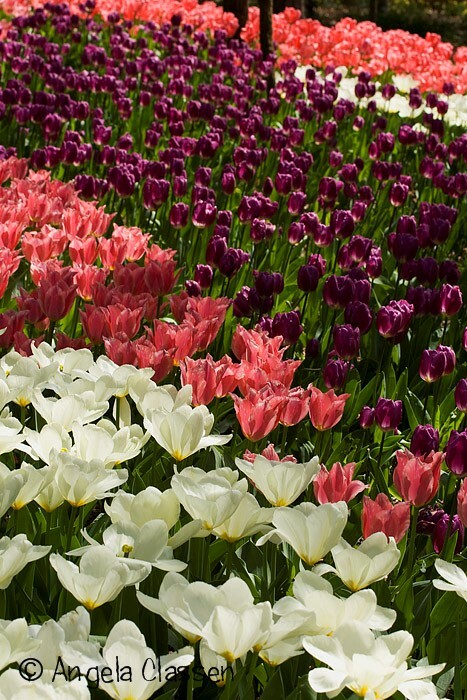 If you are in the area, I highly recommend a visit to the Garden. 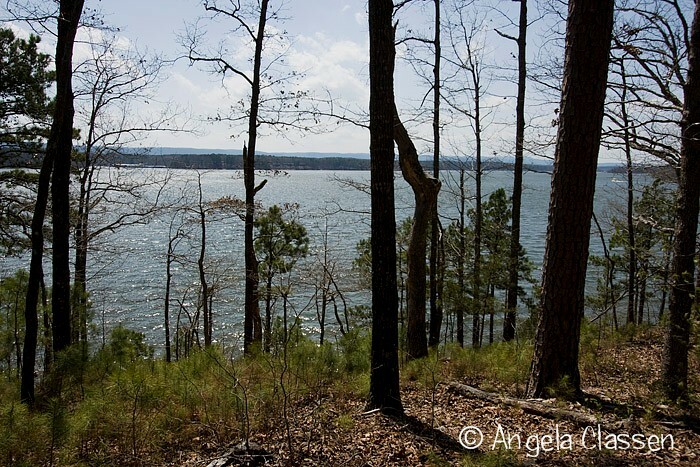 In the afternoon, we hiked an easy 3 mile loop of the Lake Ouachita Vista Trail. 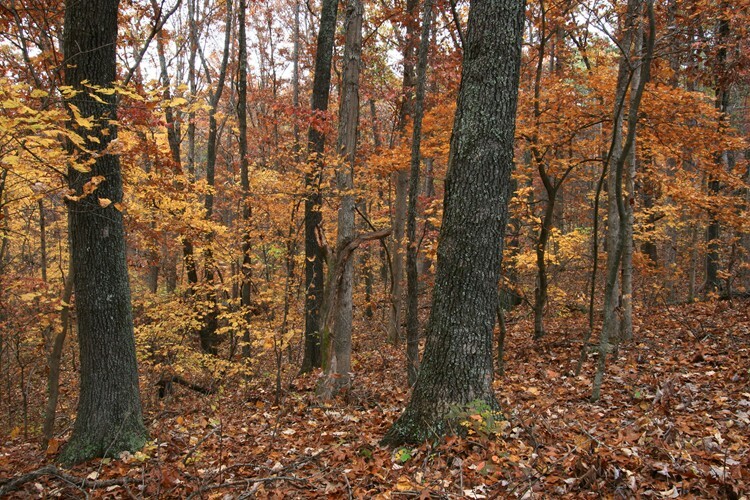 The weather was glorious and it was a great day to be hiking in the woods! Sunday was race day and the worst day weather-wise. It was cloudy, cool (in the 40’s), and a strong northerly wind was blowing. Most of my day was spent shuttling to and from the aide stations for my husband. They're off! My husband is in there...somewhere! 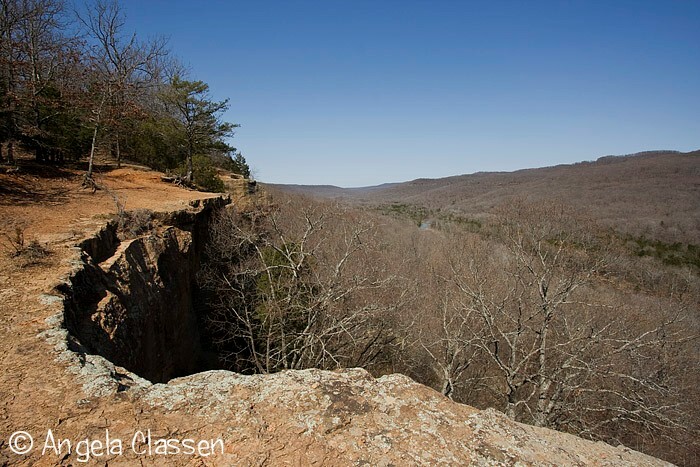 On Monday before we left, we hiked a 4 mile section of the Womble Trail and were awarded with awesome views of the Ouachita River. My favorite section of the trail was where it followed a ridge above the river for about a mile. There were large areas with lots of colorful mosses and lichens growing. We finished up the trip with a short hike on the Table Mound Trail at Elk City Lake near Independence. We had fun with our friends, and saw lots of beautiful scenery while hiking. It was a wild, fun weekend in the Ouachitas. My husband and I took a quick three-day trip to the Grand Lake, Colorado area last weekend. We drove around the area a little on Friday and ventured into Rocky Mountain National Park as far as we could go on the west side, which was at the Colorado River Trailhead. Beyond that, Highway 34 was closed for the winter. We hiked maybe a mile and half on the trail and only saw one other brave soul, a nice gentleman on cross country skis. The snow was coming down in earnest while we were on the trail, and continued overnight. Saturday morning we awoke to approximately 4-6 inches of new powder at Grand Lake! 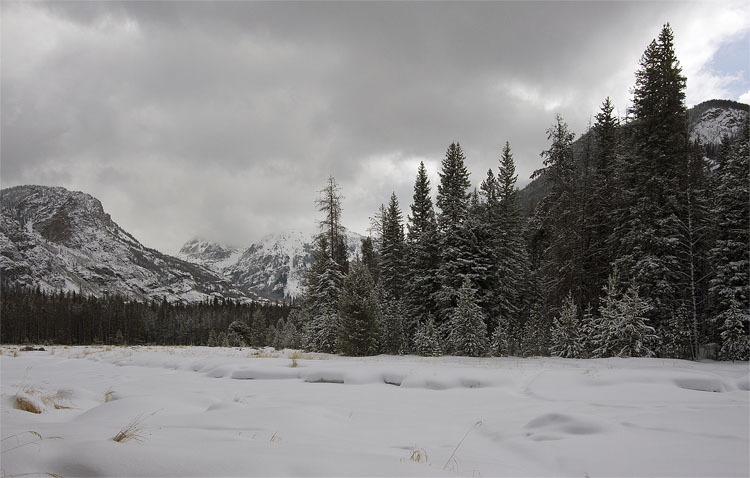 We strapped on our snowshoes and headed out for the East Inlet Trail which is within the boundaries of Rocky Mountain National Park and begins on the east side of Grand Lake. 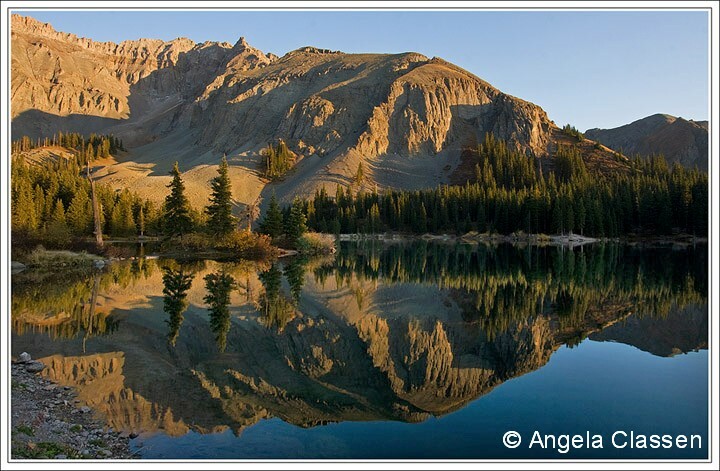 We hiked this trail several years ago in the summer, and made it all the way up to Lake Verna – a 13 mile round trip. Our objective this time was to reach Adams Falls and go somewhere beyond. This was our first time snowshoeing and I found it to be a lot of fun, although hard work. We encountered an unexpected fork in the trail only about a hundred yards from the trailhead, and my husband thought we should go to the right as he thought the trail veered off to hit the falls and hooked back up with it later. Obviously others had gone this direction before as evidenced by the fresh snowshoe tracks. We did finally find the falls (frozen of course) but we were below them rather than above. Unfortunately, after I fired off three shots, my camera stopped working. I was receiving an “Error 99” message, something I’d never seen. I replaced the battery with a fully charged one; still got the message. I took it out and placed it back in several times, to no avail. I was extremely disappointed in the camera failure as the forest was absolutely magical and I hoped to capture some wonderful scenes that morning. But, the morning was beautiful and it was difficult not to be entranced and awed at the beauty, even if I couldn’t make images. Several other snowshoers were at the falls and pointed us in the right direction to find the main trail. We had to climb a long, rather steep hill in fresh powder, which turned into quite an ordeal for me. I kept thrashing around and couldn’t get my footing or make any headway. Let me tell you, it’s a little difficult to climb a steep snowy hill when you keep falling to your knees with snowshoes strapped to your feet! Finally, with a lot of determination and my husband’s helping hand, I made it up. We found the main trail and continued on. We stopped at a viewpoint where the creek meandered through a large open meadow, and the beautiful snow-capped peak of Mt. Craig was trying to peek out of the clouds. I decided to break the camera out to see if by chance it might work. I fired off one shot, handheld – it worked! I quickly set up my tripod, and composed my shot – only to see “Error 99” AGAIN!! Gggrr!! I took the battery out, put it back in. It worked this time. I fired off a couple more shots, then the message appeared once more. How frustrating! We continued on the trail for a short way past the viewpoint then turned around and headed back to our motel so we could get back in time for the KU/Missouri basketball game (gotta have our priorities in the right place, after all). We ended up going back out to the same trail later in the afternoon and discovered the trail was so packed by this time, that we didn’t even need the snowshoes. My husband took off for a trail run, and I headed back up to the meadow viewpoint for more thoughtful shots, albeit in not-as-good light. That’s ok, they can be converted to black & white to somewhat hide that! I decided that as beautiful as the mountains are in summer, they take on an absolutely magical appearance when covered in a mantle of white. It was so gorgeous on this morning, it literally took my breath away. Or maybe it’s just because I was snowshoeing through fresh powder at 8,000+ feet! 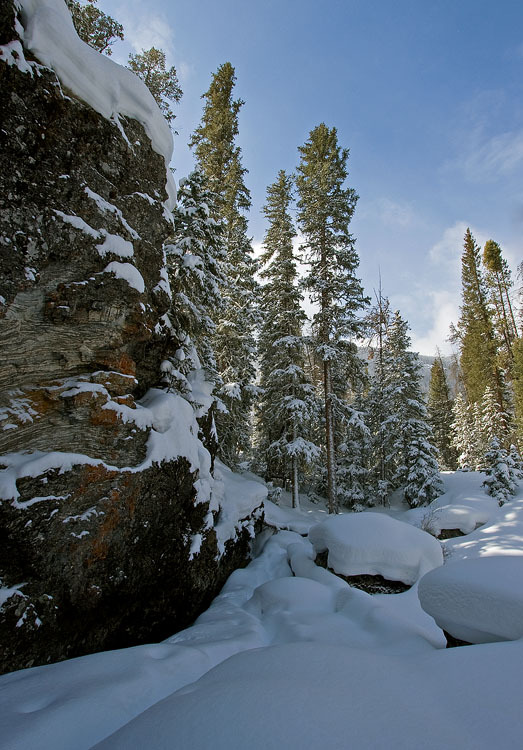 I would not hesitate to spend much more time out in the snow if surrounded by this type of scenery. My winter shooting tips might need some re-tooling, though. The temps were not terribly cold (probably somewhere in the 10-20 degree range), and I wore my ski pants, thermal shirt, flannel shirt and coat. About 20 minutes into our trek, I thought I was going to die because I was so hot! I have since read in several places that rather than layers, jackets and pants equipped with zippered compartments are a great way to dress in the cold. The zippered areas can be opened to vent heat and easily closed, whereas clothing layers are a little more troublesome. I really might need to check into that if I do some serious hiking/snowshoeing with my camera. We traveled to southeastern Missouri the weekend before Halloween and were “treated” to great foliage. 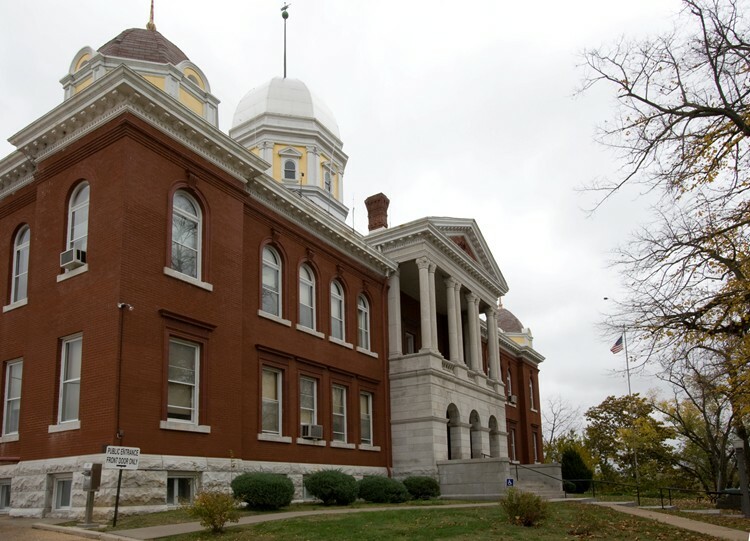 Our first stop was Hermann, Missouri. We ate lunch and checked out the Gasconade Co. Courthouse, which sits high on the banks of the Missouri River, the only courthouse I’ve ever seen perched next to a river. We then toured the Stone Hill Winery and, of course, tasted a “few” samples of their award-winning wines. The tour was very interesting and informative. I had no idea that this winery was the second largest in the nation before Prohibition. After Prohibition — well, they had to start growing mushrooms to make a living. The cellars are apparently the perfect place to propogate ‘shrooms. Today, however, the cellars are again filled with barrels of wine aging to perfection. The smell (and as we discovered later – the taste) was delicious! We had never visited a winery and really enjoyed the tour. We then traveled to Bass’ River Resort located near Steelville to check into our cabin. Upon our arrival, we discovered the Courtois Creek had swelled out of its banks and was practically up to our doorstep. Well, we were pretty high up, but the water was just below us. The next morning started off foggy, a great opportunity to get some photos. I have to thank my husband for telling me it was foggy out – I hadn’t even looked outside! I experimented with different exposures and tried not to overexpose because of the sun shining through the bright fog. Using my histogram was definitely the ticket to help me find the correct exposure in these conditions. I tried to capture a sunburst but even at F22 I just couldn’t get it pinched down enough to work successfully. The flooded creek was also cause for some excitement when the tour riders for the Berryman Epic started out. 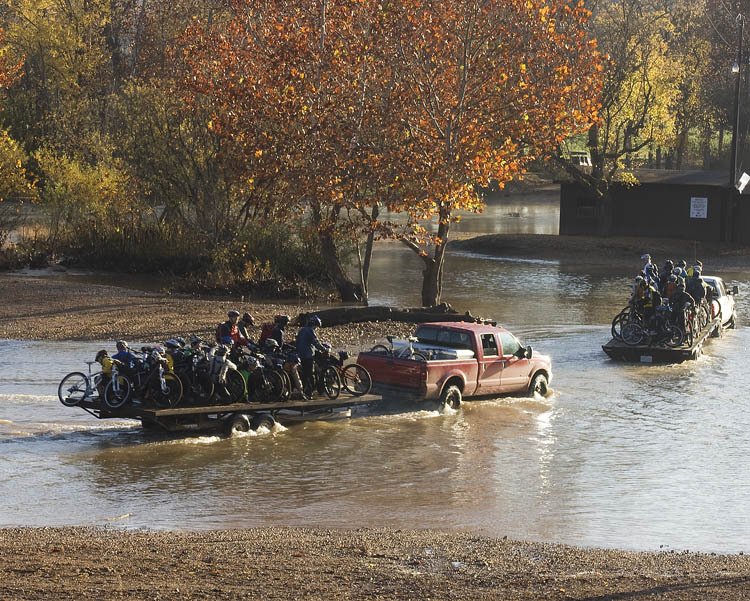 Because the creek was so far out of its banks and so deep, the riders couldn’t safely get across on their bikes, so they brought in flat-bed trailers to haul them across. There they go! It took two flatbed trailers to get them across the flooded creek. Back to Saturday… After the tour riders were ferried across the swollen creek, we took off on a back road to get to the Onondaga Cave near Leasburg. We got about 5 miles down the road and ran smack dab into a flooded creek crossing that had been barricaded. So much for the scenic back route! We re-traced our steps and took the main highway to the cave. Suffice it to say, the Onondaga Cave was awesome! Our group consisted of probably around 30 people, ranging in age from about 10 up to around 90. The cave was cold – around 57 degrees – so we had to bundle up a little bit. The first thing we saw were tiny, delicate formations called soda straws that looked like – well, soda straws! Eventually soda straws turn into stalactites. Some other formation types represented in the cave were flowstone, draperies, canopies, stalactites, stalagmites and columns. Some of the other named formations we saw were the Twins, King’s Canopy, Queen’s Canopy, and the Devil’s Shower. There was a river running through the cave which is named “The Lost River” because apparently the experts cannot figure out where all the water sources come from. The river was a blue-green color and didn’t appear to have much of a current, but once in a while you could see particles drifting along on the surface that contradicted that. The best formation was saved for last. 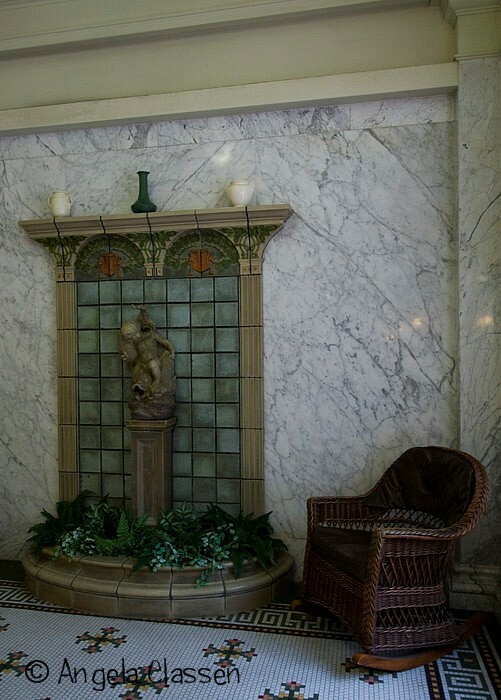 It was called the Lilly Pad Room, which was divided into two chambers. It’s called the Lilly Pad Room because some of the formations look like lilly pads. The water in one chamber was especially cool – very vibrantly colored. 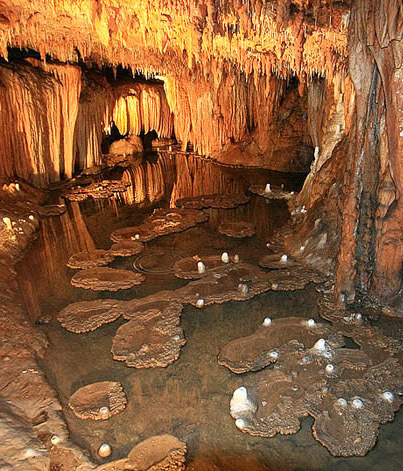 The other chamber looked almost alien like with white “drip cups” abounding. I almost wondered if some being was going to pop out at us. It was really amazing what Nature has created in this cave. After the cave tour, we ate lunch and took a 3 mile hike on one of the trails at the park. The part that followed the Meramac River bluffs was very scenic; the sun was shining bright and the foliage was brilliant. It was a great day to be outdoors and enjoying Nature at her finest. The day wrapped up with a barbecue at the Resort for the bikers, complete with a roaring bonfire. My husband took off for his race around 8:30 on Sunday, and I met him late in the morning at the Berryman Trail trailhead to give him more water and snacks. After he left, I had plenty of time to kill. The overcast sky actually was favorable for shooting foliage as it really saturated the colors, so I played with different exposures and compositions. Unfortunately, it then started to sprinkle on and off. I did stay out for quite awhile and took some foliage shots near the trailhead, and even experimented with catching the riders with different shutter speeds as they zoomed by. I finally went back to the Resort and the finish line, and just a few hundred yards away, found this wonderful little creek scene with foliage in the background and fallen leaves in the foreground. I started to walk up the trail to check it out, but then the skies finally opened up and the rain was too heavy to continue so had to pack away the camera. My husband finished the 56 mile race in a little over 6 hours. He would have finished sooner but his chain broke a few miles from the finish line and repairing it cost him about 15 minutes. All in all, we had an “epic” adventure in Missouri! 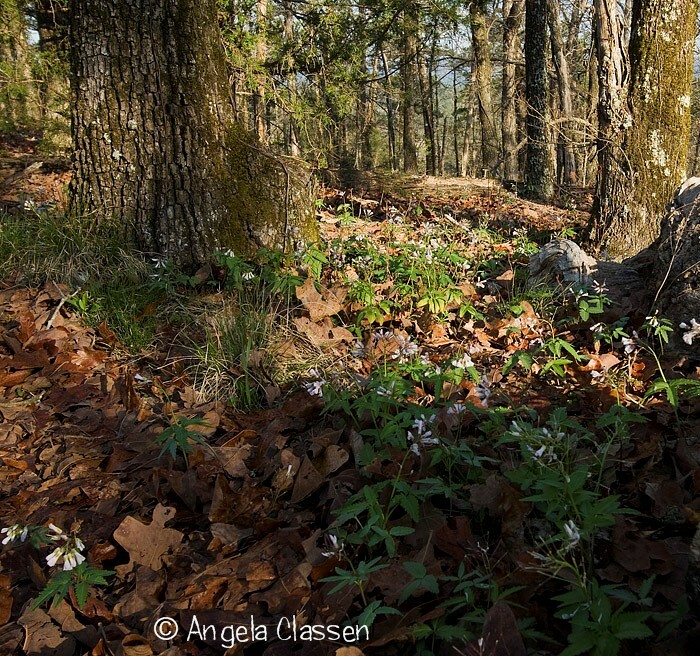 Onondaga Cave Photo Selected as NPN’s ESS Weekly Pick!! I’m very excited to announce that my photo of the Lilly Pad Room at Onondaga Cave in Missouri was selected as the Editor’s Pick for the Earth Sea Sky gallery on Nature Photographer’s Network for last week! This is my first “EP” and I feel very honored to receive this pick. The ESS gallery is the highest-traffic gallery on NPN and consistently contains hundreds of awe-inspiring images from both amateurs and pros. A little background about the cave and the photo: Onondaga Cave is located near Leasburg, Missouri and is just a few miles south of Interstate 44. 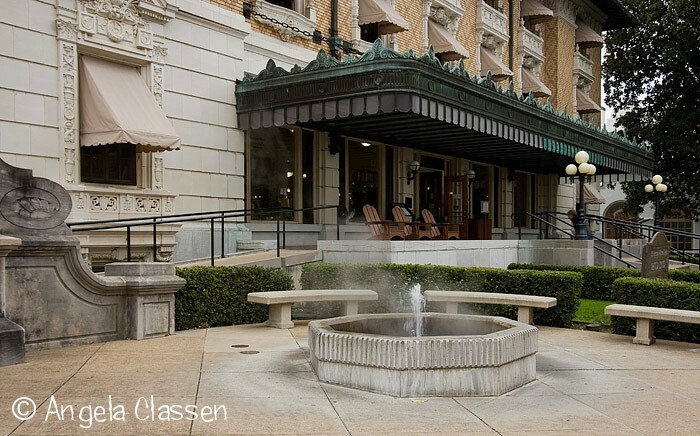 Guided tours are available March through October. We had around 30 people in our group when we toured. The cave is very open with only a few spots where the ceiling gets a bit low, so I did not feel claustrophobic at all as I did in a small cave I toured in Arkansas a few years ago. The walkways and ramps are wide and steep in places, but there are plenty of handrails. The Onondaga Cave was a private show cave for quite some time. 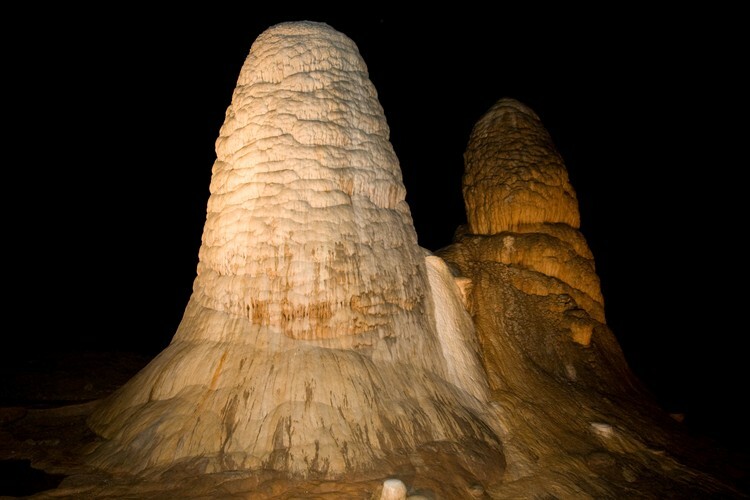 After a long, difficult history involving property disputes and almost being lost forever due to a planned dam in the area, the cave finally became part of the Missouri state park system in 1981. I had to plan ahead for shooting photos at this location since I couldn’t lug all my gear with me. Because I knew the quarters would be tight, I took my 10-22 mm lens, which is also my fastest lens at F3.5/4.0. (I also brought my 35-80 mm but never took it out of my jacket pocket.) I knew I’d have to crank up the ISO and shoot wide open if I hoped to get anything acceptable. There were lighting fixtures in place around the formations, and the walkways were lit, but after all – it was a cave and very dark! As soon as the tour started, I turned the ISO to 800 and fired off a couple test shots, and discovered I needed yet more light so cranked it as high as it would go – 1600. Unfortunately, I don’t have an off-camera flash so had to use the built-in one. In some of the shots I took, this resulted in a half-circular pattern appearing at the bottom of the frame. I found it very difficult to focus in the low-light conditions even though I was using auto focus. In some spots, the camera just couldn’t figure out what it was supposed to be doing. Compositions in the cave were very limited due to the placement of walkways, handrails and light/electrical fixtures. Because there was another tour group coming through in about an hour, there was no time to waste. This also didn’t help with trying to compose a nice shot. Additionally, tripods were not allowed so I was forced to use the handrails for support. Sometimes it worked and sometimes it didn’t because people in the group kept bumping into the rails, causing vibrations. We saw several awesome formations (the Twins, King’s Canopy, Queen’s Canopy, etc. 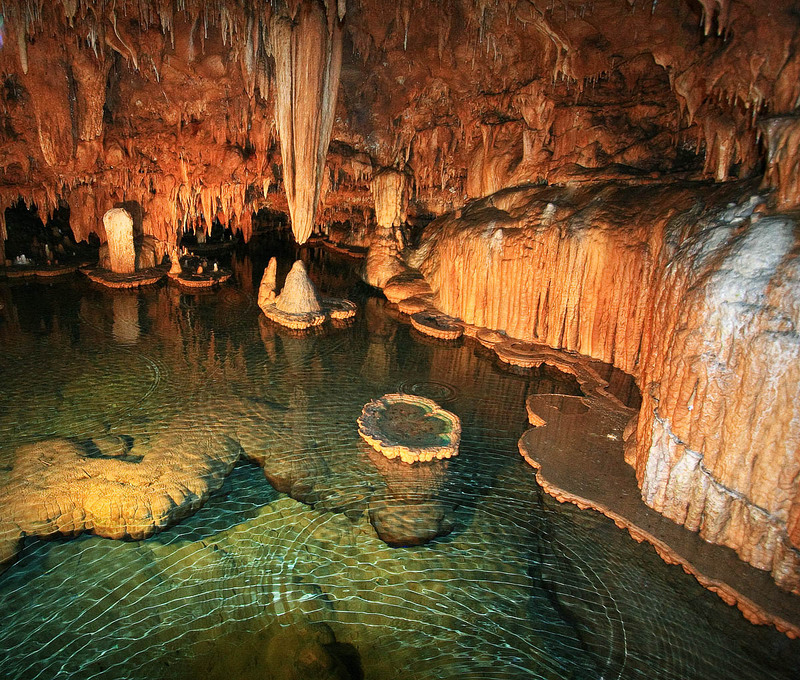 ), and the Lost River which runs through the cave was a clear, greenish-blue ribbon that contrasted nicely with the orange-hued formations. One stretch of the river was named “The Grand Canyon” because the reflection of the cave walls on the river resemble that of a view from the Colorado River in the Grand Canyon. The highlight for me though was the Lilly Pad Room, which was the very last formation we visited. It is so named because the formations at the water surface look like lilly pads. The tour guide said it was only about 20 feet below the surface and the most active formation in the cave, which I believe after seeing all the dripping going on in there. There were also formations underwater, one of which I thought looked like an intestine! I was fortunate enough to capture several concentric drip patterns while exposing this shot. It certainly adds to what could have otherwise been a pretty static image. After converting the shot from RAW format, I used the noise reduction sliders in Lightroom to reduce much of the noise in this image. I exported it to PS and finished up with some curves adjustments and a little work on the color balance due to the artificial lighting. 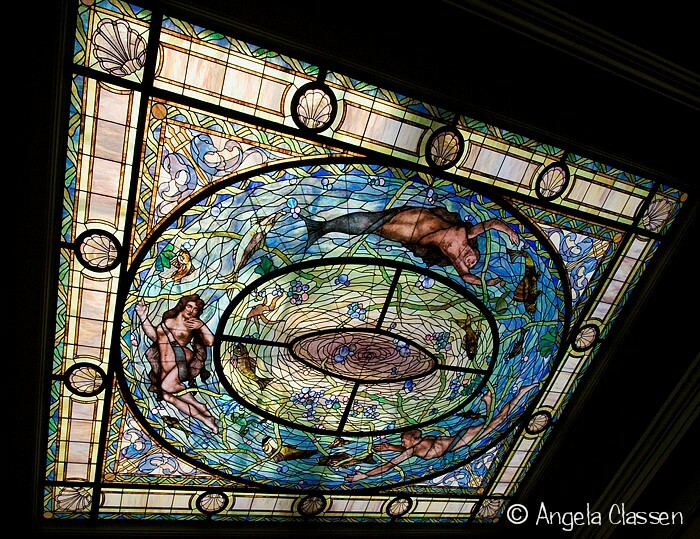 The final result is what I remember seeing while standing in this amazing little room. I’m dreaming of fabulous fall foliage in dark purples, deep reds, vivid scarlets, vibrant oranges, brilliant yellows and bright rusts. Fall is my absolute favorite time of the year! Color explodes from nearly everywhere. I noticed just yesterday that the dying hostas in my garden are even brilliant yellow. 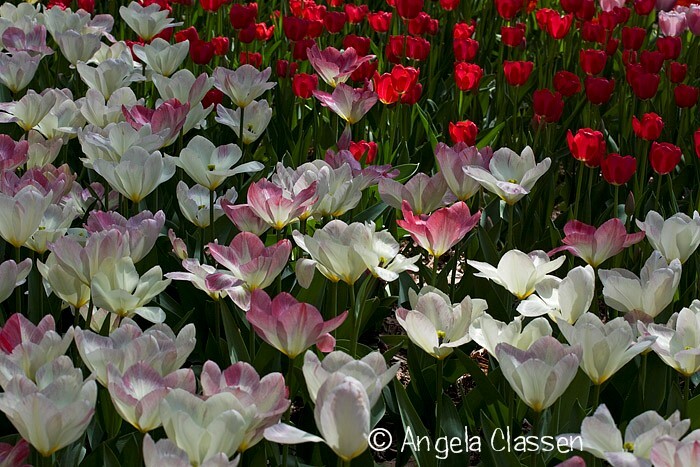 Spring is beautiful and is a sign of Nature renewing herself, but to me – fall just can’t be beat. The sky always seems clearer and the air more crisp. My husband and I are off for a few days to an area in Missouri we’ve never explored. 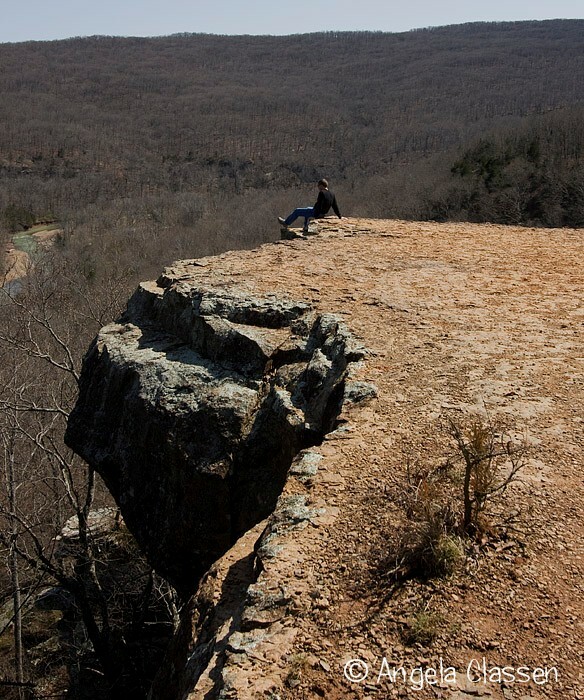 It’s about 90 miles southwest of St. Louis and is in the Mark Twain National Forest. 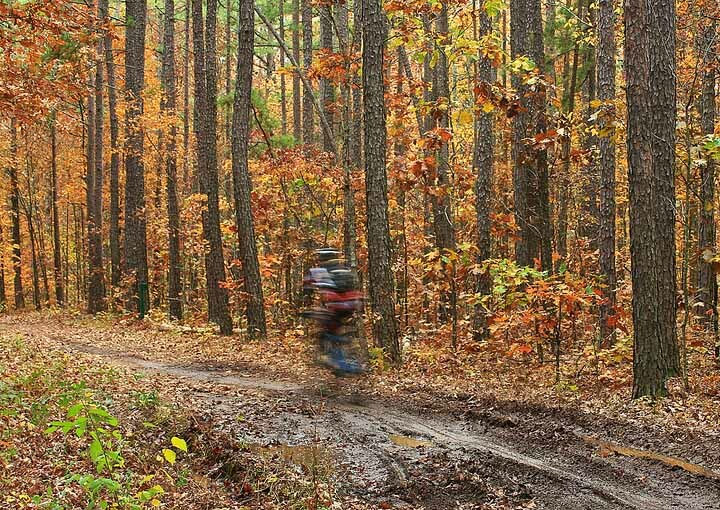 My husband is torturing himself Sunday by riding in the Berryman Epic Missouri Endurance Mountain Bike Race, a 55 mile journey down fire roads and single track. I’m not as insane as he is, so I’ll be looking for less strenous ways to pass my time – with photography of course! 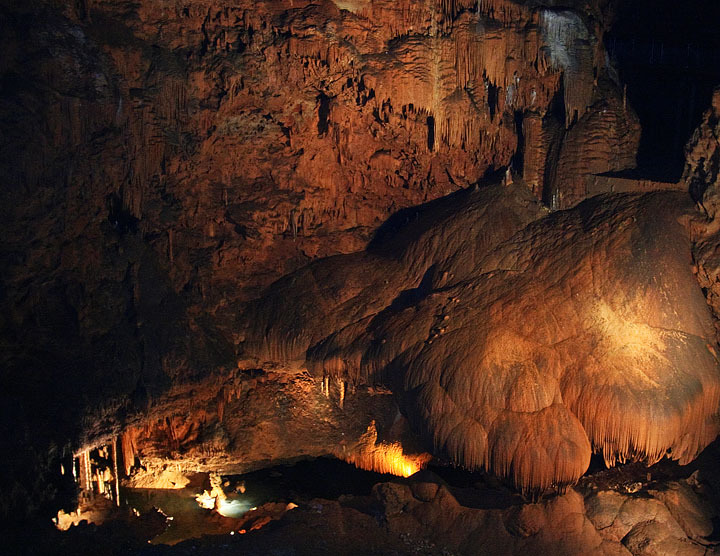 We also plan to visit the Onondaga Cave near Leasburg and hopefully get in some hiking on the Ozark trails. I’ve seen photos of the cave on the ‘net and the Lilly Pad Room looks really awesome. Unfortunately, tripods are not allowed so my Rebel XTI will be getting fully tested in higher ISO mode. Fall colors are really getting good around here now, so I can only hope the hardwood forests of southeastern Missouri will yield some wonderful photographic opportunities. 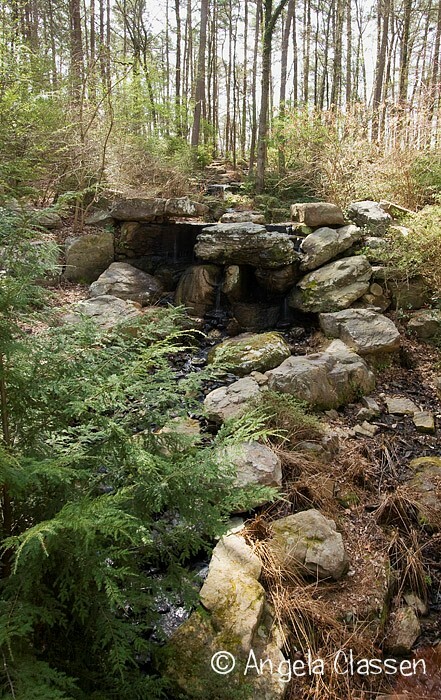 The rocky bluffs and beautiful spring-fed streams will be wonderful backdrops for the foliage. Check back in a few days for a trip report!